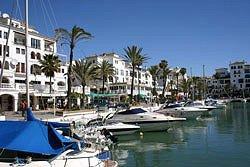 For more pictures of Duquesa Marina and Beaches click here ! Duquesa Marina is the ideal place to dine on the evening, or to enjoy long sunny, lazy afternoon lunches. There are a very broad selection of restaurants, ranging from quite sophisticated a la carte restaurants to pizza joints and Chinese and Indian Restaurants. There are lots of bars, offering different facilities and atmospheres. The emphasis is on the family and although most evenings are very busy in the summer months, there are no night-clubs and the atmosphere is friendly. Most of the bars have satellite TV's so you needn't miss the cricket or football if thats a major concern to yourself or your kids. Either side of the port is flanked by long sandy beaches. For details of Duquesa Marina and local restaurants click here !